ALL-ITEMS: For the month of July 2017, Belizean households saw the prices of goods and services which they regularly purchase rise by 0.6 percent, on average, when compared to the same month in 2016. The All-Items Consumer Price Index for the month stood at 104.4, an increase from 103.8 in July of 2016 (See Figure 1). 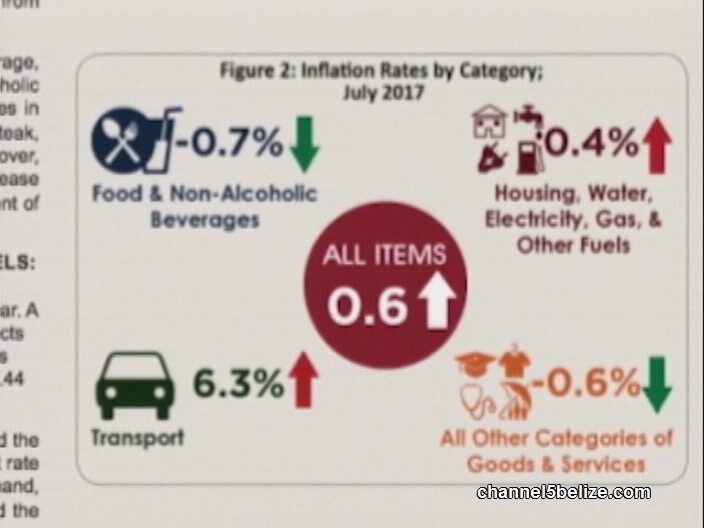 For the first seven months of 2017, a year-to-date inflation rate of 1.4 percent was recorded. TRANSPORT: The ‘Transport’ index was once again the major driving force behind the overall rise in consumer prices for the month, with prices within this category recording a 6.3 percent increase in comparison to July 2016 (See Figure 1). This rise in transport costs was attributed in large part to significantly higher airfare prices, which experienced a spike in early 2017. The increase in bus fares, which took effect in late 2016, was also a major contributing factor, as was an increase in the prices for new motor vehicles. ‘Fuels and Lubricants’ saw a relatively small increase of 0.7 percent when compared to the same month of last year, with the most notable increase being recorded for the price per gallon of Premium gasoline, which rose from $9.51 in July 2016 to $11.04 in July 2017. Regular gasoline rose from $9.56 to $10.10, while the price per gallon of Diesel was up from $8.55 to $8.94 (See Table 1). Food and Non-Alcoholic Beverages: On average, consumers spent 0.7 percent less on ‘Food and Non-Alcoholic Beverages’ (See Figure 2) as this category recorded decreases in the prices of several food items including ground beef, beef steak, whole chickens, onions, cabbage and limes (see Table 1). Moreover, this decline in ‘Food’ prices served to offset a 9.6 percent increase in the average prices for beer, the effect of the recent adjustment of excise taxes. For the month of July 2017, Orange Walk Town, which recorded the most significant decrease in home rental prices, saw the lowest rate of inflation at negative 1.2 percent. Dangriga, on the other hand, which experienced the greatest rise in home rental prices, had the nation’s highest inflation rate at 2.7 percent (See Figure 3). July 2017: During the month of July 2017, Belize’s imported goods were valued at $154.1 million, down by 8.4 percent or $14 million from the $168.1 million imported in July of 2016. On the other hand, the month saw increases in imports for the categories of ‘Mineral Fuels and Lubricants’, ‘Chemical Products’ and ‘Crude Materials’. Belize spent $22.2 million on ‘Mineral Fuels and Lubricants’ in July 2017, a growth of $6.6 million over July 2016, owing to greater imported quantities of diesel, premium and regular fuels. 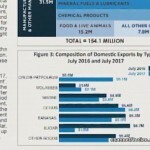 Importation of ‘Chemical Products’ went up by $5.7 million, from $14 million in July 2016 to $19.7 million in July 2017, as purchases of fertilizers, antibiotics and other medical supplies continued to trend upward. Additionally, imports of ‘Crude Materials’ doubled for the month, from $1.9 million to $3.9 million, as the country saw a spike in pine lumber and pasture grass seed bought from abroad. JANUARY TO JULY 2017: Merchandise imports for the seven months January to July 2017 amounted to $1.05 billion, representing a 5.3 percent or an almost $59 million decrease from the same period last year. 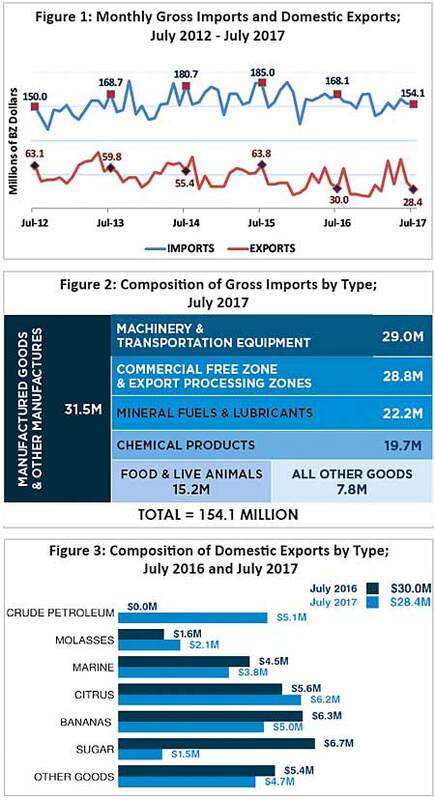 Consistent with what was recorded for the month of July 2017, falling purchases of ‘Machinery and Transport Equipment’, was the primary cause of the drop in total imports over the period. That category fell substantially, by almost a quarter or $68.1 million to the $211.6 million recorded for the period January to July 2017, with telecommunications equipment, vehicles and agricultural equipment observed to be the goods in greatest decline. In contrast, the country spent over 20 percent or $22.3 million more on ‘Mineral Fuels and Lubricants’, as higher fuel prices, particularly for Regular, Diesel, Butane and Premium fuels, drove that category up from $106.7 million in 2016 to almost $129 million in 2017. July 2017: The total value of Belize’s domestic exports for the month of July 2017 was $28.4 million, down 5.3 percent or $1.6 million from the $30 million recorded for July 2016. Sugar exports for the month fell sharply by $5.2 million, from $6.7 million to $1.5 million, and was principal reason of the overall downturn in domestic export earnings for the month. 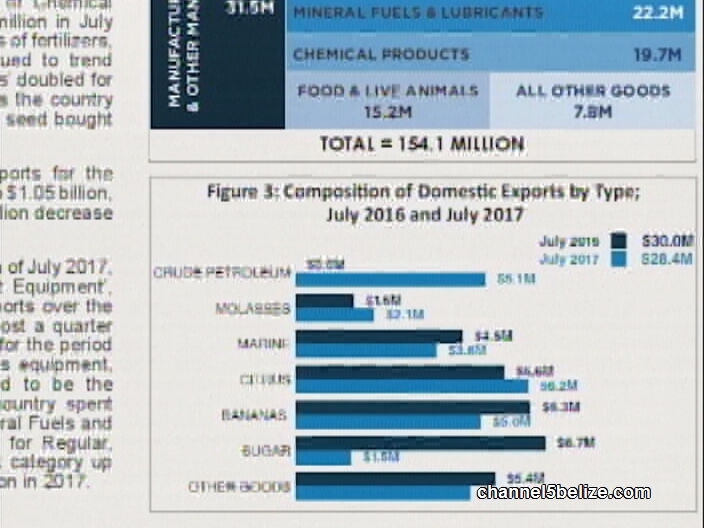 To a lesser degree, reduced exports of bananas and marine products also contributed the decline, with decreases of $1.3 million and $0.7 million, respectively. Citrus products, however, performed positively for the month, with an uptick in earnings from $5.6 million in July 2016 to $6.2 million in the same month of 2017, as most products across the citrus category, particularly orange concentrate and orange oil, did well on the world market. The month’s most marked increase in earnings came from the country’s crude petroleum exports, which brought in $5.1 million in earnings for July 2017. In contrast, there were no exports of this commodity recorded for same month in 2016. As a result of the strong performance recorded for crude petroleum during the month, exports to the CARICOM Region, the only recipient of this product at this time, nearly doubled from $5.2 million for July 2016 to almost $11 million for July 2017. On the other hand, exports to the European Union, less the United Kingdom, plummeted from $10.2 million to $3.4 million owing to the reduction in sugar sales for the month of July 2017. JANUARY TO JULY 2017: Merchandise exports for the period January to July 2017 totalled $304.7 million, up 16.4 percent or $42.9 million from the same seven months of last year. Sugar was the most significant contributor to total export earnings over the period, with earnings from that commodity growing by over 60 percent, from almost $68 million in 2016 to $109.1 million in 2017. Along with a 37 percent increase in exported volume, sugar also benefited greatly from higher prices on the world market. 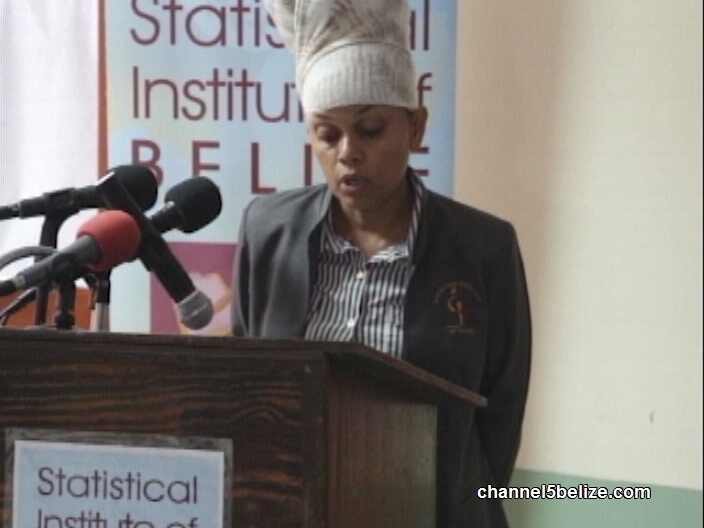 Belize’s other major exports, banana, crude petroleum and marine products, also had positive showings over the period. Export revenues for bananas rose by $4.7 million to $46.7 million over the seven months, while favourable prices drove crude petroleum earnings up by almost $4 million to $16.5 million. Sales from marine products grew modestly over the period, from $19 million to $21 million. Notwithstanding the fact that shrimp exports doubled over the period, from $3.2 million to $6.4 million, this industry remains far from recovered and lobster tail, with earnings of $7.6 million for the seven month period, has emerged as the most significant export within the marine products category. Citrus products, Belize’s second largest major export category, faced a 16.7 percent loss in export earnings over the period, falling from $75.4 million to $62.8 million, despite recording a surge in orange oil earnings. 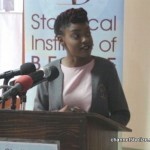 The Statistical Institute of Belize’s preliminary Gross Domestic Product estimates for the second quarter of 2017 showed that, during the three months from April to June of this year, the country’s overall level of economic activity increased by 1.1 percent when compared to the same period in 2016. 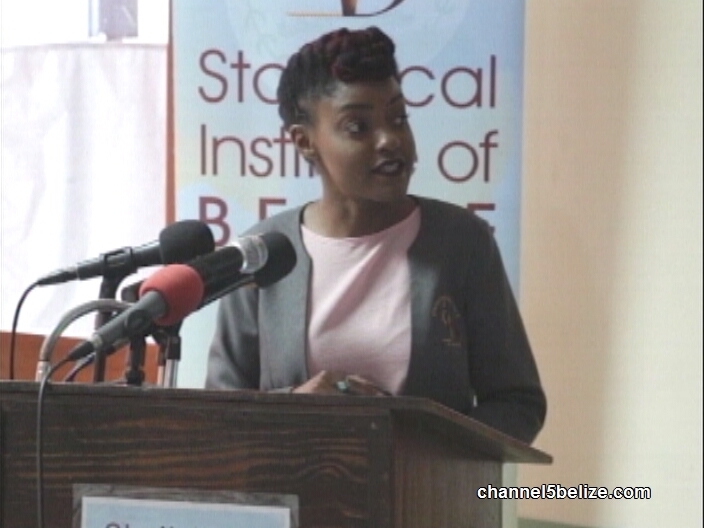 The total value of goods and services produced in Belize was $737 million, up almost $8 million from $729 million in the second quarter of 2016. For the first half of the year, the country’s level of production was 1.1 percent higher than in 2016. 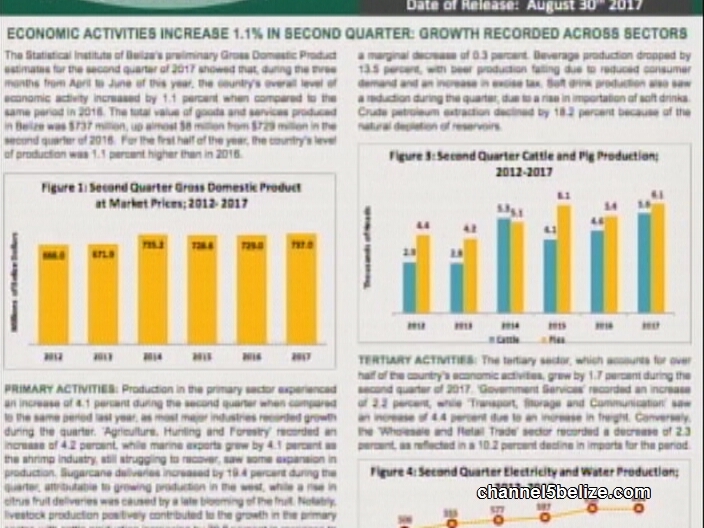 PRIMARY ACTIVITIES: Production in the primary sector experienced an increase of 4.1 percent during the second quarter when compared to the same period last year, as most major industries recorded growth during the quarter. ‘Agriculture, Hunting and Forestry’ recorded an increase of 4.2 percent, while marine exports grew by 4.1 percent as the shrimp industry, still struggling to recover, saw some expansion in production. Sugarcane deliveries increased by 19.4 percent during the quarter, attributable to growing production in the west, while a rise in citrus fruit deliveries was caused by a late blooming of the fruit. Notably, livestock production positively contributed to the growth in the primary sector, with cattle production increasing by 20.8 percent in response to favorable market prices, while pig production grew by 12.8 percent due to increased market demand. These increases were partially offset, however, by a decrease in poultry production. Banana shipments, on the other hand, dropped by 34.4 percent, from 23 thousand metric tons to 19 metric tons, as yields fell short of expectations during the quarter. SECONDARY ACTIVITIES: Secondary activities recorded an increase of 0.7 percent for the second quarter, primarily as a result of continued strong performance in “Electricity and Water.” Electricity generation rose by 5.6 percent compared to the second quarter of 2016, as demand increased and favourable weather conditions positively affected hydroelectric power production. Water distribution, likewise, was up in comparison to the second quarter of 2016, recording an increase of 0.6 percent due entirely to increased demand. Despite an increase of 18.3 percent in the production of sugar and a 30.1 percent increase in the production of citrus concentrate, ‘Manufacturing and Mining’ recorded a marginal decrease of 0.3 percent. Beverage production dropped by 13.5 percent, with beer production falling due to reduced consumer demand and an increase in excise tax. Soft drink production also saw a reduction during the quarter, due to a rise in importation of soft drinks. Crude petroleum extraction declined by 18.2 percent because of the natural depletion of reservoirs. 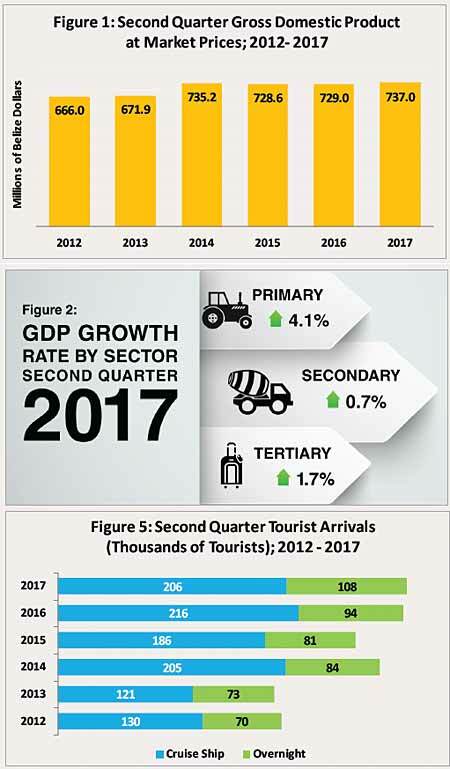 TERTIARY ACTIVITIES: The tertiary sector, which accounts for over half of the country’s economic activities, grew by 1.7 percent during the second quarter of 2017. ‘Government Services’ recorded an increase of 2.2 percent, while ‘Transport, Storage and Communication’ saw an increase of 4.4 percent due to an increase in freight. Conversely, the ‘Wholesale and Retail Trade’ sector recorded a decrease of 2.3 percent, as reflected in a 10.2 percent decline in imports for the period. ‘Accommodation and Food Services’ recorded a decrease of 2.4 percent, despite an increase of 14.2 percent in overnight visitors, with tourists more frequently opting for less costly accommodation options. Cruise passengers recorded a decrease of 4.8 percent, due to the fact that there were two less cruise ship calls in the month of June when compared to the same period of last year. 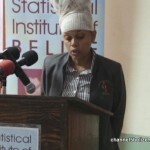 Figures released by the Statistical Institute of Belize show that economic activity slowed down to some extent in July. Goods and services went up slightly, while imports and exports registered a drop. The price of fuel, however, went up considerably in the past year. The rise in transport costs were attributed in large part to significantly higher airfare prices, which experienced a spike in the early part of this year. News Five’s Isani Cayetano reports. Consumer prices for the month of July were up marginally by point six percent, as Belizean households saw a slight increase in the cost of goods and services. 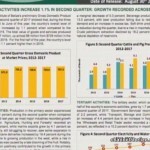 The External Trade Bulletin, on the other hand, indicates that imports and exports for the month of July are down by eight point four percent and five point three percent, respectively. Economic activities between the months of April and June grew by one point one percent, bringing the total value of goods and services produced locally to seven hundred and thirty-seven million dollars in the second quarter. That’s an increase of approximately eight million dollars when compared to the same period in 2016. Perhaps the most interesting comparison is the growing cost of fuel. Costs at the pump were compared for the same period in 2016 and 2017 and the increase is apparent.